Even with that twisty on/off knob at the end of the barrel, little tykes apparently still have no trouble using spray bottles filled with poisonous cleaning products. 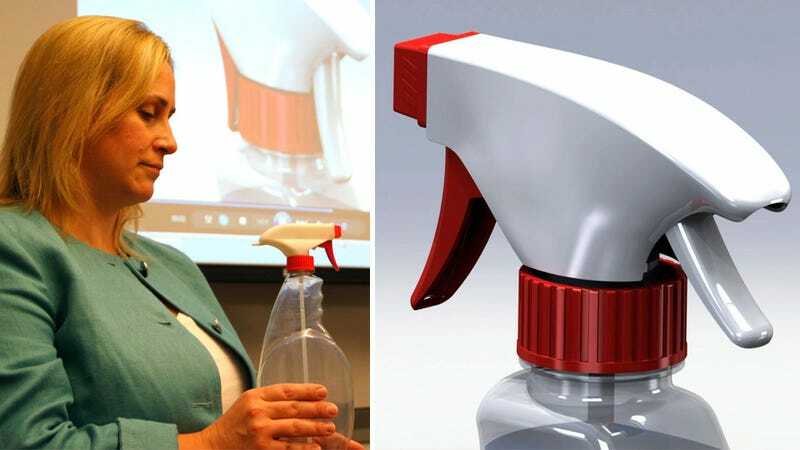 So to make them safer for households with inquisitive kids, researchers at the Nationwide Children's Hospital and Ohio State University have created a new spray bottle design with a kid-proof two-stage trigger. Not only are younger children lacking the developmental capabilities to properly operate the new design—which requires each of the triggers to be pressed in sequence before the bottle will spray—their hands are also just too damn small and weak to use the squeeze mechanism. And since most adults never set a spray bottle back to its off position when they're done, this new design automatically locks itself after every use. So take that toddlers.